The Meaco 1200i Swimming Pool Dehumidifier is the most powerful unit in the four unit Meaco swimming pool dehumidifier range. The 1200i is identical to the lower capacity 800i in appearance, dimensions, weight and versatility but exceeds it in moisture extraction capacity by one third and is a considerably more powerful dehumidifier. Like the other three units the 1200i is very quiet in operation and in this respect is the most impressive of the four, given its huge capacity. Professional pool managers will be well able to assess their requirements for a dehumidifier and to select a unit of appropriate capacity but for many other operators, such as hotels, and for private owners the whys and wherefores can be confusing. It is advisable to consult the supplier directly for precise information. The details you will be asked to provide will include information as to whether or not a cover is used, the surface area of the pool, the water temperature and the ambient temperature of the air within the pool enclosure. To provide a little more guidance, if the ambient temperature is 2°C higher than that of the water and a cover is used this dehumidifier will be sufficiently powerful for a pool with a surface area of up to 157m2. Swimming pool dehumidifiers are constructed to high quality standards to withstand operation in very humid conditions and to resist the potentially damaging effects of the chemicals typically used in pools. The Meaco 1200i, for example, has three layers of anti-corrosion protection. These qualities may be desirable in other commercial applications and particularly so where a wall-mounted unit is preferable. It should be noted that this dehumidifier is designed for use in heated areas with an ambient temperature of at least 15°C and will not be suitable for applications where the temperature is not maintained to this level or above. The Meaco 1200i swimming pool dehumidifier will remove a massive 197 Litres of moisture from the air over a 24 hour period. This performance data was obtained at a temperature of 30°C and relative humidity of 80%. These test conditions are also applied to residential dehumidifiers but in the case of a unit designed for use in a pool are a little more representative of the performance an operator may realistically expect. In other applications in which ambient temperature and relative humidity may be lower a correspondingly smaller amount of moisture will be removed. Nevertheless the 1200i is an exceptionally powerful unit with substantial benefits for commercial operators who need a dehumidifier for an area where customers and/or employees are continually present. Disposal of the condensate is by means of a continuous drainage facility which operates by means of a gravity feed. This requires a drain or other water outlet within a few metres of the unit at floor level. This is typically easy within a swimming pool but may be less so in other applications. Operators who need to transfer the condensate over greater horizontal distances, or to lift the water to a level above the dehumidifier, will require a separate condensate pump. There is not an integral condensate pump available with the Meaco 1200i which may be a disadvantage in some commercial applications. The required level of relative humidity is programmed into an electronic, adjustable humidistat. Once programmed the Meaco 1200i will operate automatically to maintain the chosen level. For more precise control a remote radio humidistat is available in two versions. In the event of an interruption in the electricity supply the auto-restart feature incorporated in the 1200i will switch the unit back on when the power is restored. The Meaco 1200i is not simply a dehumidifier but is available in a version that will also heat the pool area. The heat is provided by means of a Low Pressure Hot Water (LPHW) heating system which draws hot water from your boiler through a pipe incorporated in the dehumidifier which then returns heated air into the pool enclosure. Dehumidifiers typically raise the temperature of processed air by 2°C and, combined with the LPHW heating system output of 4kW, this produces a total output of 8.4kW. Like all Meaco swimming pool dehumidifiers the 1200i is relatively light in weight at 96Kg. 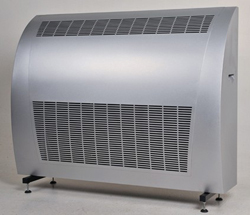 Its external dimensions are identical to those of the 800i at 31.0 x 95.0 x 125.0cm, making the Meaco 1200i exceptionally compact for a dehumidifier of its power. The modest depth and height of this unit suit it for the most preferred option of wall-mounting but a floor-mounted installation is provided for, using the purpose designed mounting. For even better use of space and to remove the dehumidifier from view the Meaco 1200i is configured for through-the-wall mounting to allow it to be installed on the reverse side of a pool enclosure wall. Additional kit must be purchased to allow this and the results are impressive with the only visible sign of the dehumidifier being two unobtrusive grills in the interior wall of the pool enclosure. In all our reviews of Meaco swimming pool dehumidifiers we have drawn attention to the exceptionally low noise output of these units. The Meaco 1200i is perhaps the most impressive of the four with an operating noise level of only 46dB. This makes the unit exceptionally suited to those pools where the users are seeking quiet and relaxed recreation. Our conclusion is that this unit completes the Meaco range of swimming pool dehumidifiers with yet another effective unit ideally suited to the purpose for which it was designed.